Honestly I mean it. 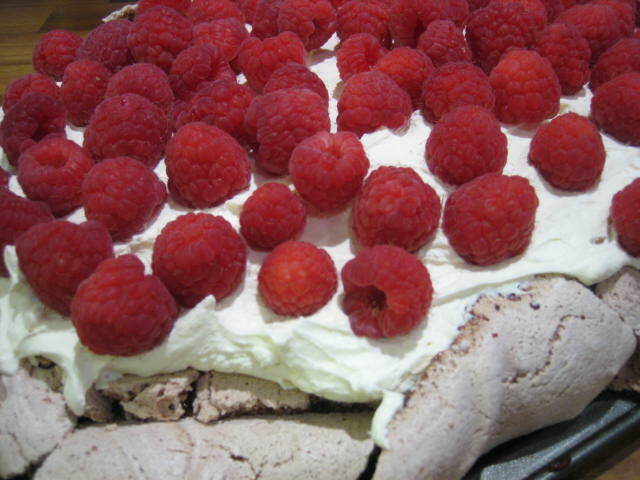 You would have to be slightly mental not to absolutely love this Pavlova. Many many years ago one of my friends handed me a tatty photocopy of a Nigella Lawson Chocolate Pavlova recipe and made me promise that I would make it. She assured me that I would not be disappointed. And was spot on. I have no idea where the original recipe is now but this makey-uppy version is now one of my “old faithfuls”. 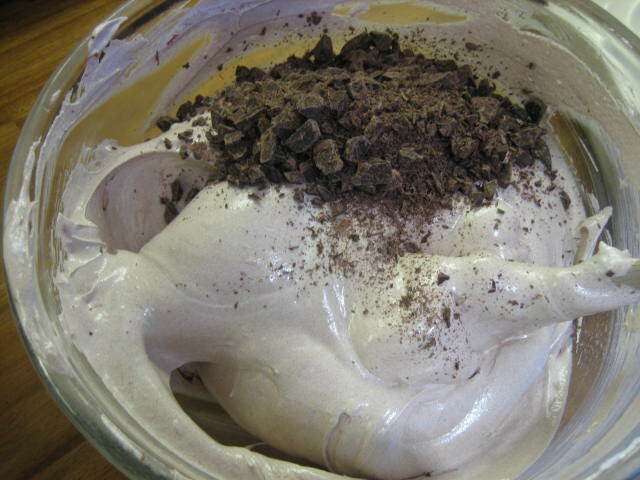 Meringue is honestly not difficult to make. The best thing about it is even if it cracks and looks like an absolute disaster it still tastes and looks amazing as soon as you cover it with whipped cream and fruit. Perfect! Take a large mixing bowl and wash it thoroughly with hot soapy water to ensure there is absolutely no oil in it. Meringue hates oil!! Separate the eggs and add only the white to the bowl – do not get ANY yolk in the egg white this will affect the whites from whisking properly. If you do get some yolk or egg-shell in your whites use one of the halved egg shells to remove it rather than a spoon – sounds daft but it makes getting the shell/yolk out much easier. Weigh out your caster sugar. 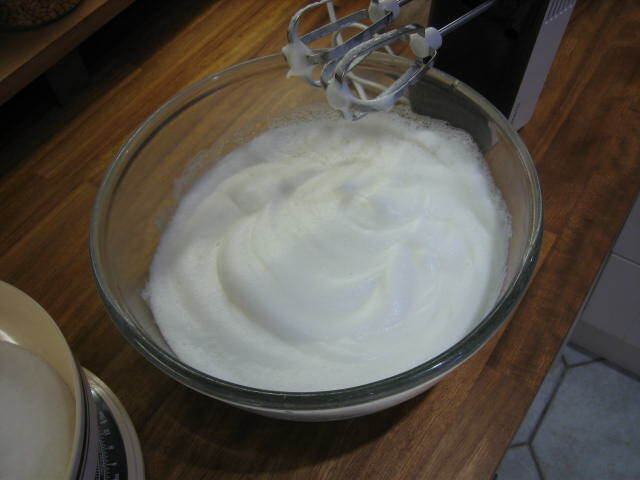 Whisk whites until stiff peaks form – I used an electric whisk – you can use a manual whisk but prepare for arm burning. Slowly add sugar a couple of table spoons at a time and whisk. Keep doing this until all the sugar is combined and mixture is shiny and thick. Add tsp of white wine vinegar, 2 tbsp of cocoa powder, finely chopped chocolate and 2 tsp of corn flour and gently fold through until combined. Dollop mixture onto a baking sheet lined with grease proof paper, spread out into a round or oval (consider what you are serving the pav on and try to make the shape suit the serving dish). 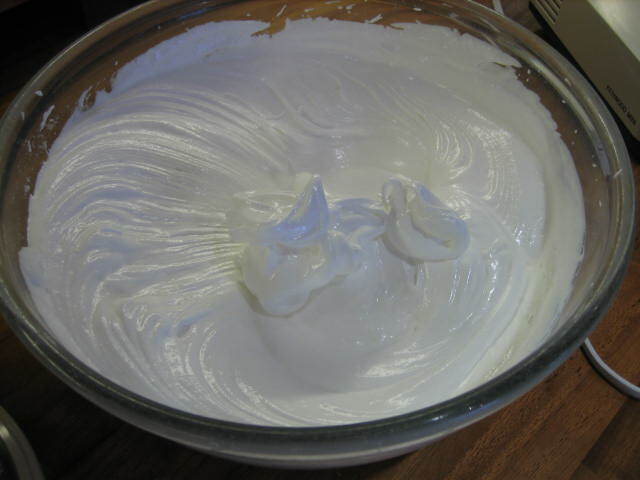 Remember the meringue will spread out a little bit so make it smaller than the serving dish. Pop it in the oven and immediately reduce the temp to 140 degrees (fan forced). Bake for 45 mins and then allow to cool in the oven. The centre should still be squidgy a little like a baked chocolate mousse. 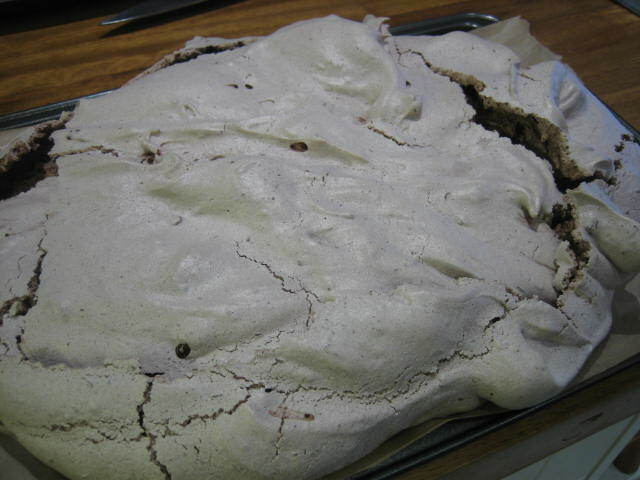 Once cool remove from oven and pop onto serving dish flipping the meringue over so that the bottom side is up. 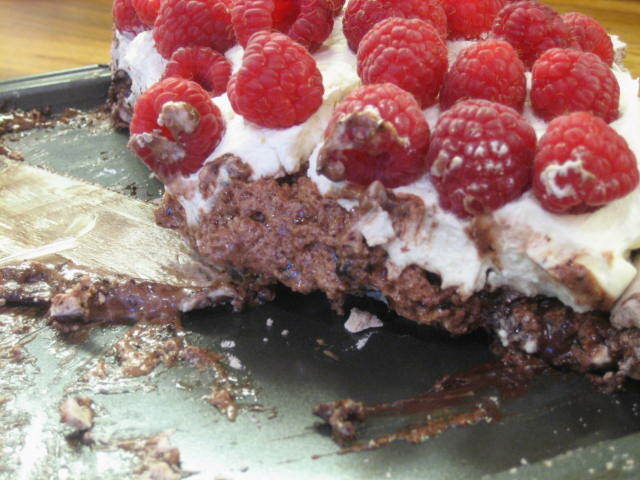 Whisk cream until soft peaks form and spread over the Pavlova, cover the top with raspberries and voila – joy on a plate! 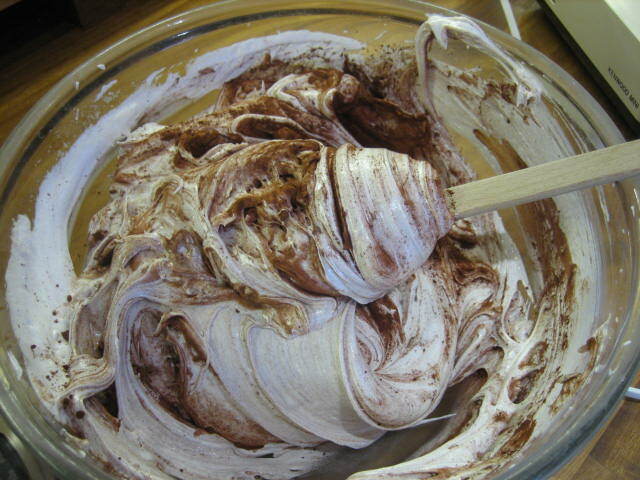 You can grate a little chocolate over the top too or dust with icing sugar if you are feeling “creative”, I have also made these as individual small meringues which is great for a party – they do not need as much time in the oven – about 20 mins. 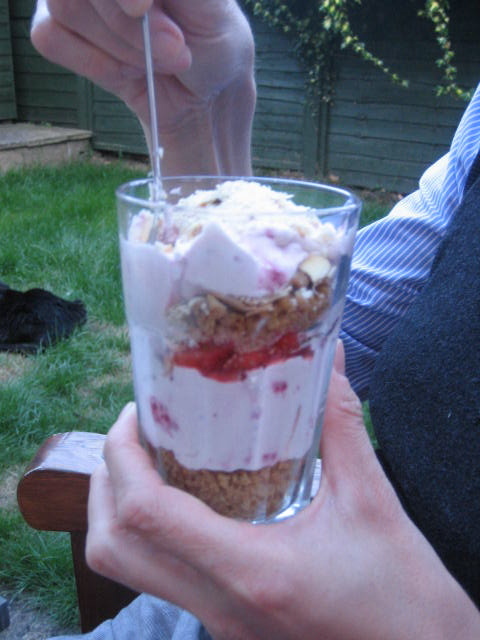 Just to say again – you have to try this recipe!!!!! It is so exciting there are tons and tons of wild raspberries everywhere! I had been looking forward to making jam during bramble season (blackberries) and had completely forgotten about raspberries. I actually don’t remember ever seeing wild raspberries before but they are here and there are tons of them. It would be a crime not to pick them and make jam. 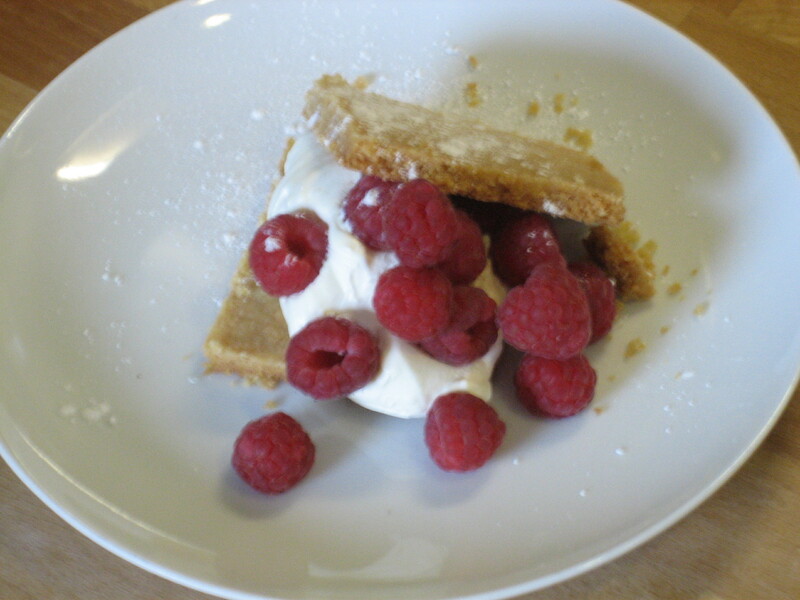 Place the raspberries in a large non reactive bowl and layer with the sugar. Cover with plastic wrap and leave in fridge over night. Next morning add the lemon juice and place in a large pan (ideally enamel). 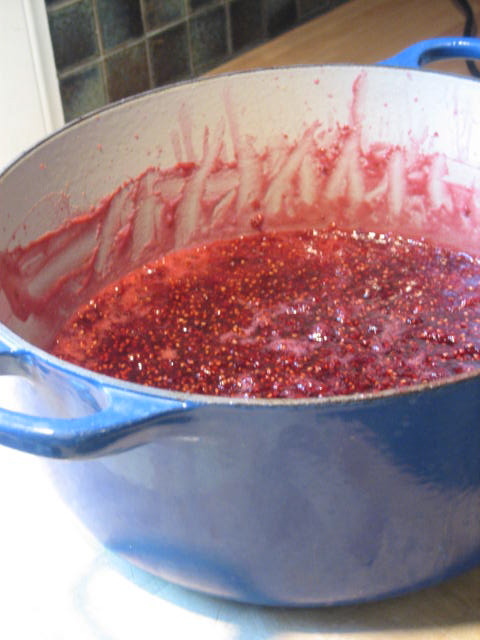 Bring to the boil then reduce the heat and simmer for 25 – 30 minutes or until jam reaches setting point. Tip: To check to see if the jam is at setting point put a spoonful of jam onto a cold plate and leave for 20 seconds. Then run your finger through the middle. If the line stays and the jam doesn’t run back, the edges of the jam wrinkle a little the jam is set. If not keep simmering until it does reach setting point. 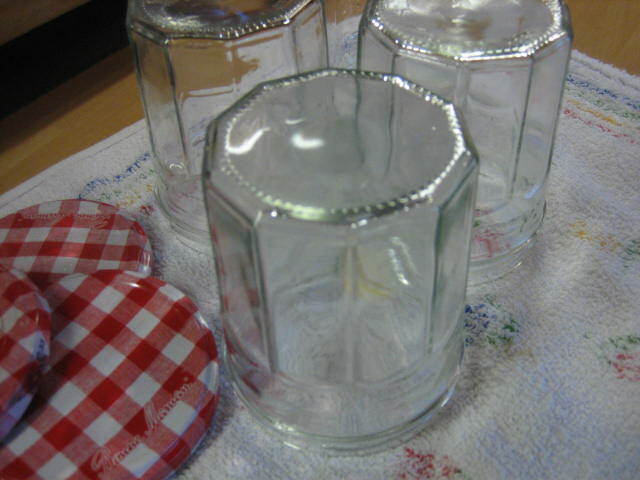 Skim the top then fill sterilised jam jars. 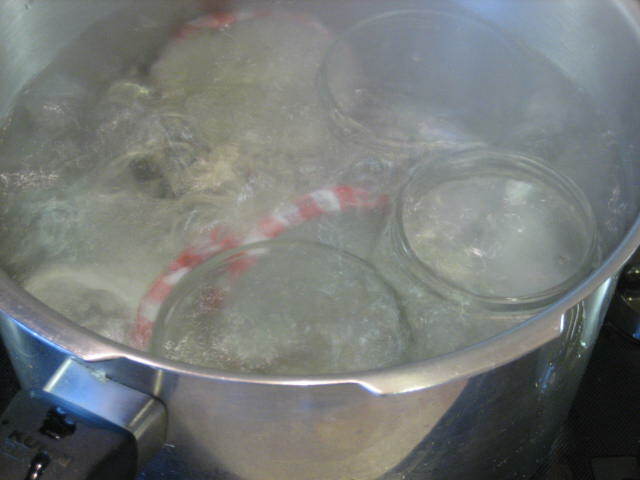 Tip: To sterilise jars wash lids and jars then boil in water for 10 – 15 mins. Note: If I do this again I would probably pass half of the raspberries through a sieve so that you do not end up with too many seeds. 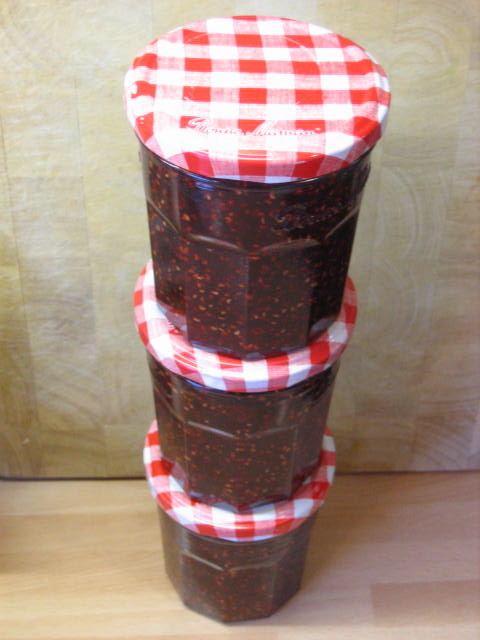 I recommend you eat the jam with homemade scones (see recipe). Yummy! !